I am currently busy with a study of Babylon the Great in Revelation 17 that I hope to publish in the near future. It is fairly slow going, but in the meantime, I want to write briefly on something related to my previous article, Christadelphians and Catholics: Prospects for Dialogue: a certain Christadelphian's definition of what it means to be Catholic. There are some Christadelphians who are former Catholics and thus have some firsthand knowledge and experience of Catholicism. However, I think it is fair to say that the great majority of Christadelphians have no minimal firsthand knowledge or experience of Catholicism. Their ideas about the Catholic Church come largely from three sources. The first source is Christadelphian literature and discourse, which takes a strongly polemical stance on Catholicism and views the Catholic Church through the lens of biblical apocalyptic. The second source is the news media, which reports (for instance) on the activities of the Pope and on various other happenings within the Catholic Church that may be of public interest, including scandals. Since "News content is dominated by the negative," as is "clear enough to any regular news consumer,"1 allowing news stories to shape one's perceptions of Catholicism will probably not lead to an objective picture—especially one whose exposure to Christadelphian polemic has already coloured (poisoned?) their perspective. The third source is interaction with individual Catholics—neighbours, coworkers, classmates, friends. In the developed, English-speaking countries where most of the world's Christadelphians are concentrated (U.K., Australia, USA, Canada, etc. ), a significant proportion of Catholics are nominal (self-identifying as Catholic but not consistently practicing the faith) in contrast to devout (making a consistent effort to practice the faith). When one's personal interactions with Catholics tend to be mostly with nominal Catholics, there is a risk of mistaking nominal Catholicism for authentic Catholicism. 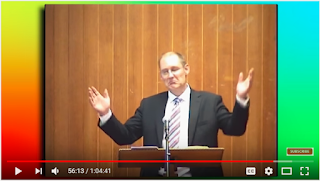 This error is well illustrated in a video I recently encountered of one Neville Clark, a Christadelphian speaker in Enfield, Australia, offering his take on "the real definition of a Catholic". You can watch Clark give his definition in the video below (starting at 54:45) or read it in the transcript that follows (copied from here). You know, it would be a mistake, brothers and sisters, if we didn’t take a personal lesson from this, what is the real definition of a Catholic, isn’t it just someone who is superficially religious? Someone who thinks they will get looked after in the end because they are part of a system, that their baptism in some way, gives them a ticket to salvation, and despite the fact that their life is basically worldly, and completely inconsistent with the principles of this book, they will be accepted because God says he loves them, isn’t that how Catholics think? What would that look like if it crept into the ecclesia? What would it look like in terms of our attendance? Would you say, that it would be like going to the meeting Sunday morning and forgetting every other class of the week because we are just too busy? What would it look like in terms of our spirituality, would you say, perhaps it could be that there was no real need to do the Bible study because that’s the speaker’s job? What would it look like in terms of our worship? Wouldn’t that be the use of modern music that talks all about what Christ has done for us and nothing about what our responsibilities are to him? Isn’t that how Catholicism works? You don’t have to attend anything but Sundays, and in fact, if you can’t make it, that’s fine, just turn up at Christmas and Easter. Bible study? You don’t even need a Bible to be a Catholic, we pay people to do the Bible Study for you, and music? Let us briefly comment on seven claims that Clark makes within his definition of a Catholic. 1. Catholics are superficially religious. I am not sure how Clark claims to know this—can he, like Jesus, read people's minds or judge their hearts? However, I think the self-imposed spiritual discipline and charity of many Catholics is evidence of their inner piety. Does a superficially religious person forego the joys of marriage, sexuality and raising children in order to devote oneself to prayer and service of others? Does a superficially religious person willingly undergo martyrdom? The saints and martyrs of the Church provide a powerful testimony to the authenticity of Catholic piety. 2. Catholics are complacent about their eternal destiny because of the system they belong to and their baptism. Anyone who has read the Catechism of the Catholic Church on topics such as sin, the sacraments, grace, justification and holiness will know that complacency about one's eternal destiny has no place in the Catholic faith. This criticism is ironic in that Reformed Protestants level exactly the opposite criticism against the Catholic Church. They claim that Catholics are insecure about their eternal destiny and are motivated to piety by fear because they lack assurance of salvation. 3. Catholics take God's love for granted and thus live worldly rather than godly lives. Again, the Catholic Church has a rich tradition of saints of whom many were ascetics and anything but worldly. Of course it would not be difficult to find a nominal Catholic who lives a worldly life, but such a Catholic would find no theological basis for this lifestyle in the moral teaching of the Church. 4. Catholics focus only on what Christ has done for them and not about their responsibilities toward Christ. Again, this is precisely the opposite of the criticism that Calvinists often level at Catholics, saying that by focusing too much on our responsibilities toward Christ we neglect his finished work on the cross. Once again, reading the Catechism would easily dispel both misconceptions: Catholicism emphasises both the work of Christ and our responsibilities toward Christ. 5. Catholics do not have to attend anything but Sundays, and even attending only at Christmas and Easter is fine. This means that Catholics must go to Mass every Sunday, as well as certain holy days in the liturgical calendar (including Christmas and Easter). Deliberately not attending without a valid reason is a grave sin, meaning that it destroys one's salvation if one is not absolved from it (through the sacrament of reconciliation, i.e. repenting and going to a priest for Confession). Catholics do not technically "have to" attend Mass other than on Sundays in the sense of a sacred obligation that one neglects at one's eternal peril. However, the Catechism states that "the Church strongly encourages the faithful to receive the holy Eucharist on Sundays and feast days, or more often still, even daily" (CCC 1389). This is why Mass is held every day in Catholic churches. Besides Mass, the wider moral teaching of the Church strongly mandates involvement of all Catholics in church activities. In my parish, whenever an adult is received into the Church they are required to announce publicly which ministry they plan to join. 6. Catholics do not need Bibles because they pay someone else to do Bible study for them. It is, needless to say, a rude caricature of the Church's ministerial orders to depict them as people paid to study the Bible by others who are too lazy to do so. That there exists a teaching ministry in the Church founded by Christ is surely beyond dispute on the basis of the New Testament. Moreover, that the Catholic Church has specially ordained and trained teachers of the Word does not mean that lay Catholics "do not need Bibles." The Catechism states that "The Church 'forcefully and specifically exhorts all the Christian faithful. . . to learn the surpassing knowledge of Jesus Christ, by frequent reading of the divine Scriptures. Ignorance of the Scriptures is ignorance of Christ'" (CCC 133). This is no mere lip service to the notion of private Bible reading: Catholics all over the world have a set of daily Mass readings that they would hear read publicly if they attend Mass that day, and are encouraged to read and meditate on privately if they do not. 7. Catholic worship music is self-evidently bad. I am not sure what Clark's point was about Catholic music, because he expressed it mainly with body language, ending his critical definition of what a Catholic is with "and music?" followed by a dismissive shrug (see screenshot below). Apparently Clark considers it to be self-evident what is wrong with Catholic music. Based on his prior comments critical of "modern music," it may be that he objects to the use of modern worship music in the Catholic Church. I'm afraid I don't follow. I don't know what kind of music Catholics sing in South Australia, but it might interest Clark to know that in my parish in Cape Town, South Africa, we mainly sing hymns accompanied by an organ. Many of the hymns we sing are the same hymns I learned growing up in a conservative Christadelphian ecclesia in Canada. I might add that, as a member of my parish choir, my own experience has been that Catholics put far more effort into singing these hymns as they are meant to be sung—typically with a four-part harmony that has been well practiced by a choir. I would not want to hastily generalise based on my own limited experience, but I think that the style of music in many Catholic churches (hymns set to organ music) would be quite amenable to a traditionally minded Christadelphian like Clark. Of course, for every Clark who (apparently) dismisses Catholic music for being too "modern," one could find a critic who dismisses Catholic music for being too "old-fashioned" or "traditional." Clark's "real definition of a Catholic" is uncharitable and he offers no evidence to support his sweeping generalisations—not even any anecdotal evidence from his own experience, much less any evidence that his claims are broadly representative of Catholic teaching and practice. I couldn't help but notice that at several points, Clark was making exactly the opposite criticism of Catholicism than what I have encountered elsewhere. Clark says Catholic religiosity is too superficial; others say it is too radical (hair shirt or flagellation, anyone?). Clark says Catholics are smug about their eternal destiny; others say Catholics are too fearful about their eternal destiny. Clark says Catholics are too worldly; others say they are too otherworldly or too ascetic. Clark says Catholics focus on the finished work of Christ to the neglect of their own need to work for Christ; others say the reverse. Clark says Catholics are too lax about church attendance; others say they are too rigid to the point of legalism. Clark seems to think Catholic worship music is too modern; others say it is too traditional. The reader is encouraged to read the full chapter of Chesterton's book, which contains numerous examples of this phenomenon, some of them quite similar to what we have noted above about Clark's critique. I hope that Clark and Christadelphians who might share his ideas will drop this grotesque caricature of Catholicism and aim for at least a modicum of objectivity in their definition of what a Catholic is. This could be achieved by reading the Catechism of the Catholic Church (to get an accurate understanding of Catholic doctrine), by attending Catholic Masses (to experience Catholic liturgy and religious life firsthand), and by befriending devout Catholics. Perhaps this is too much to ask of Clark, but I hope that Christadelphians who are able to recognise the unfairness and inaccuracy of his definition (and other similar statements that are regularly made, and received uncritically, in Christadelphian meetings) will be moved to investigate the Catholic faith for themselves and get their information "from the horse's mouth." 1 Stuart Soroka and Stephen McAdams, "News, Politics, and Negativity," Political Communication 32 (2015): 1. 2 Gilbert K. Chesterton, Orthodoxy (New York: Dodd, Mead and Company, 1908), 155.